Celebrated as one of the most popular French Impressionist artists, Pierre-Auguste Renoir was famed for his nudes and images of lavish Parisian modernity and leisure. Still, his art was more complex and thoughtful and besides being a skillful colorist with a keen eye for capturing the moment of light and shadow, thanks to exploring the Renaissance painting, his mature works are characterized by integration of line and composition. Working alongside Claude Monet, Renoir was a key person and one of the leaders of Impressionism, although unlike theirs, his paintings had conspicuous human element that set him apart. He was also only one that noticed the limitations of the expression based just on optical sensations and light effects, asserting the necessity of underlying structure and composition in modern painting. His theories were particularly important and widely incorporated into the major later movements as Fauvism and Cubism. Regarded as the master of facial expressions, his early works features pleasant, light themes of everyday life conveyed with the use of his distinctive technique of broken brush strokes of bright colors that portray the light and movement of the subject, reflecting his enjoyment of painting figures, particularly of women. Creating structural and monumental vivid paintings, Renoir bridged the gap between early colorists like Raphael, Rubens, Watteau and Delacroix and 20th-century great minds Henri Matisse and Pablo Picasso. Renoir was born in 1841, in Limoges, French city in the central west area, known as the center of porcelain production in 19th-century. It was natural path that young artist took his first job as a painter in one of the factories. Growing up in a working-class family, as the son of tailor and sewer, he had deft hands, inheriting the talent for the detail and decoration that distinguished him among the other employers and draw the attention of wealthy patrons for whom he started to create different decorations. This early success encouraged him to leave the job and devote himself to fine art painting. He began with the visits to Louvre where he studied the French Rococo masters, Jean-Antoine Watteau, Jean-Honore Fragonard, Francois Boucher and Romantic painter Eugene Delacroix. He noticed the similarities in their brushstrokes and handling of paint, but also the departure from the classical norms by giving priority to color and movement instead of form. Entering the studio of a Swiss academic painter Charles Gleyre, Renoir directed his future career, due to the acquaintance with Claude Monet, Alfred Sisley and Frederic Bazille who became his close friends and future Impressionist colleagues. They often visited the forest of Fontainebleau to paint in plain air. Still, unlike his friends, Renoir always preferred work in studio and more traditional approach based on the style of the masters he admired. His friend Jules le Coeur owned the house in the southern border of the forest and, during the time, the artist accepted Fontainebleau as a favorite painting place, especially after 1865, when he was here introduced to Lise Trehot who became his lover and model for numerous portraits. One of these paintings, Lise with a Parasol, was received at the Salon of 1868. Familiar with the Salon’s standards, this portrait was created in a conventional manner in a combination of soft lines and clear coloration with the strict naturalism that evoked great Realist painter Gustave Courbet. 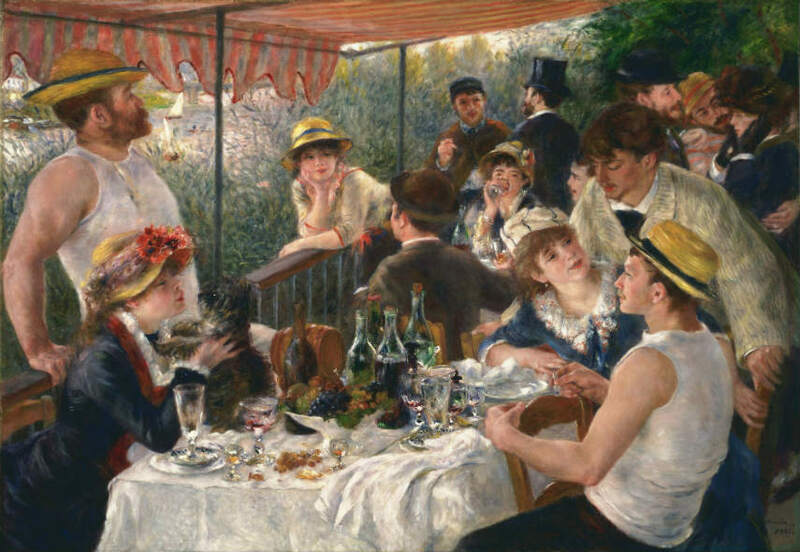 Decisive for the further course of art history, the summer of 1989 was the time when Renoir and Monet laid the foundation of the style that would be later known as Impressionism. Two colleagues spent two months painting at La Grenouillere, a lakeside boating resort near the Paris. The indication of new approach was their use of broad brushstrokes with the aim to capture momentary scenes and natural movement of water surface with the reflection of light on it. After the Franco-Prussian War in which he fought in and the occupation of the French Commune in 1871, everything changed for Renoir. Also, his 10-year friendship with le Coeur ended and he lost his favorite place for painting and source of patronage. He was in a situation when he had to choose whether buying a paint or paying a model. The Salon rejected his paintings, but he insisted on submitting work until 1873, believing that was the only way to achieve success. According to some of his writings, he thought that collectors were not capable of liking a painter who didn’t have the backing of the Salon. 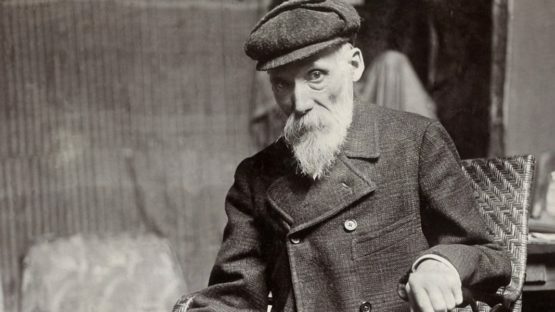 Still, he decided to join his friends Monet, Sisley, and Pissarro in their plans for the organization of the independent exhibition of their works, deprived of the strict and outdated propositions of the Salon’s jury. The first Impressionists exhibition was held on April 15, 1874, and although it didn’t meet critical acclaim, Renoir sold few paintings and attracted the attention of the collector Victor Chocquet who became his financial supporter during this period. Hoping to secure his income for a longer period, he decided to display mostly portraits at the second Impressionist exhibition in 1876, but next year he showed a more diverse range of themes and among these paintings were distinguished Dance at Le Moulin Galette and The Swing. 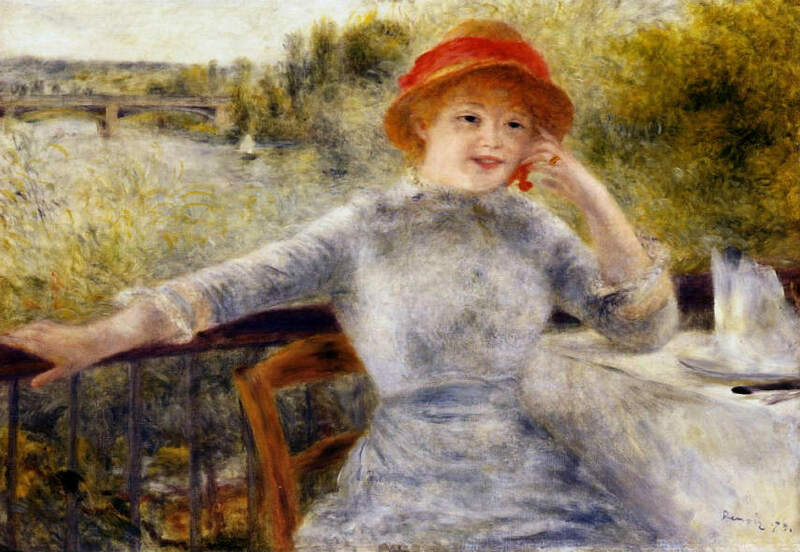 Renoir chose not to exhibit at fourth and fifth Impressionist exhibition and instead submitted again to the Salon which now accepted his work and thanks to success of Mme Charpentier and her Children (1878), he became widely accepted and fashionable painter. As he later wrote to the art dealer Ambroise Vollard, by the early 1880’s, he felt that he had “reached the end of Impressionism and could neither paint or draw.” This feeling encouraged him to move toward more Classical ideas of composition and modeling. He decided to take a trip to Italy and before he left, he produced iconic Luncheon of the Boating Party (1880-1881) that already showed his technical change toward greater composition unity. His mature work no longer focused on expressing the movement and light but got closer to the coloring of Rococo and late Renaissance. Further inspired by his trip to Italy and later Spain, and England, Renoir drastically changed his approach. He even visited Algeria, following the steps of Eugene Delacroix and Madrid with the aim to study Diego Velazquez and Francisco Goya. In Italy, he admired Titian’s and Raphael’s masterpieces and met composer Richard Wagner at his home in Palermo where he painted his portrait in only half an hour. Summer 1883 which he spent on one island in the English Channel painting landscapes with beaches, cliffs, and bays, was a very productive considering the fact that re managed to produce fifteen paintings for little more than a month. When he returned to France, Renoir married Aline Victorine Charigot who was a model for his Luncheon of the Boating Party and got three sons with her. Although having a problem with continually failing health, after the bicycle accident his right arm was affected by arthritis, rheumatism plagued his left eye, and by 1910, he was mostly relegated to a wheelchair, he continued to produce a considerable number of art pieces. Purchasing a home in Cagnes-sur-Mer in the south of France, appropriate climate helped him to feel some relief. Great art dealer of that period, Ambroise Vollard, became his important patron and trusted friend who proposed him, according to his physical limitations, to attempt sculpture introducing him to young sculptor Richard Guino who worked in clay. 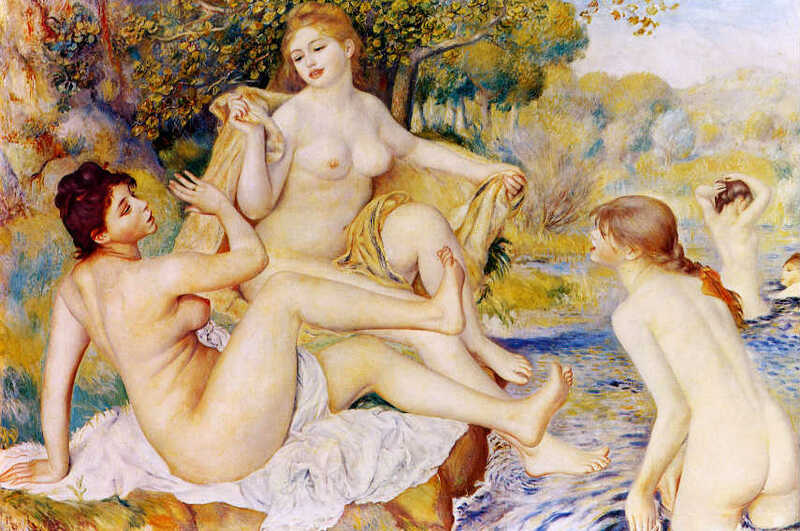 Renoir created several very successful sculptures. La Grenouillere (1869) represents the popular leisure place during the summer days where young Renoir with his friend Monet often painted developing new theories and techniques that became the basis of the future Impressionism. Unlike his friend who was focused on effects of light, Renoir always paid more attention to a human figure and stability of the composition. La Loge (1874) was one of the paintings presented in the first Impressionist exhibition that celebrated Parisian modern life. Having a very important role in society, the theater was popular place especially for the middle class to see and be seen and this painting depicted exactly the moment when the woman lowered her opera glasses, allowing her face to be seen. 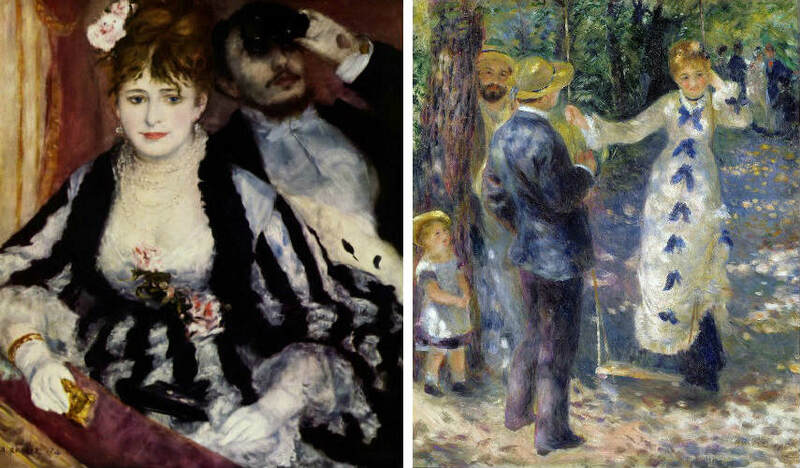 Beside her is a man (Renoir’s brother) who leaned back in his seat exploring the upper balconies with his glasses. The artist’s keen eye is recognizable for masterful treatment of detail on their clothes and jewelry. 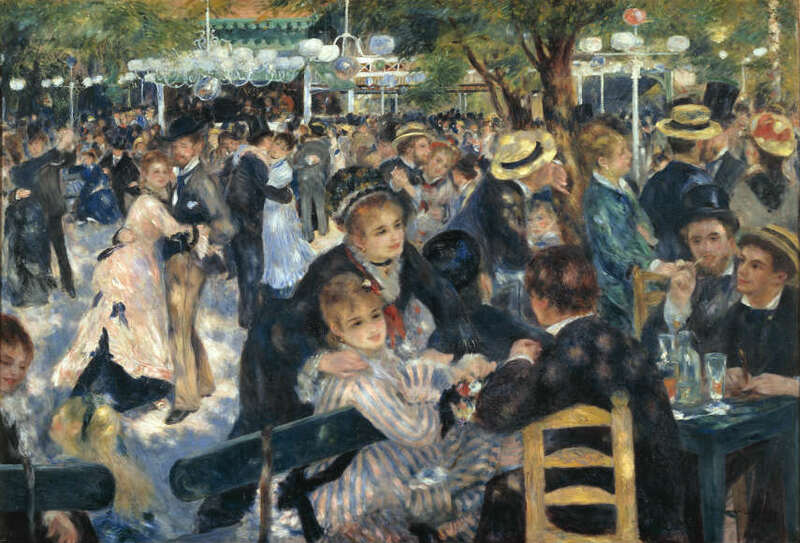 Dance at the Moulin de la Galette (1876) is among Renoir’s masterpieces. Typical Impressionist scene depicts one moment of everyday life in the fashionable part of the city, near Montmartre where the middle-class people gathering for dancing, drinking, and dining. This unusual monumental piece (4 x 6 feet) reflects his extraordinary sense for the detail, capturing the scene with sheer quantity of people who do different things, conjoined under the flickering sunlight and parts of shade from the treetops above. Luncheon of the Boating Party (1881) represents more intimate scene with the number of his close friends, and future wife Aline Charigot. Looking beyond individual portraits, this painting is a beginning of his distancing from the Impressionism. Creating a scene less crowded with people but more full of light, shadow, and color, Renoir was getting closer to the Classic ideals of monumental and structural painting. The Umbrellas (1881) is a fine example of his use of underlying structure that he introduced into the Impressionist visual language. It represents the basis for the later movements, like Post-Impressionism and Cubism that adopted and developed Renoir’s approach to form. Experimentation with color and light is joined with stronger line and emphasized geometric forms hidden in the background. The Large Bathers (1884-1887) evokes Ruben’s approach to the High Renaissance techniques. Renoir worked three years on this painting, making numerous preparatory drawings and sketches. Skillfully merging timelessness of Classical style with modern modes of painting, the artist moved away from the smaller, in the moment captured images of Impressionism. Portrait of Ambroise Vollard (1908) represents the celebration of their friendship. Besides revealing the artist’s considerable possibilities as a portraitist it shows his characteristic structure, coloration and impressionistic application of paint. Vollard was so great supporter and admirer of Renoir’s art that he published his biography in 1925. His illness developed numerous deformities in his hands, forcing him to change his painting technique. Paralyzed fingers and bandages on his hands required and assistant to place the brush. Last twenty years of his life, he created with limited mobility using moving canvas and picture roll. In the winter of 1919, Renoir suffered heart attack and shortly after died in his family home in Cagnes-sur-Mer. He lived enough long to see his paintings in Louvre next to the masterpieces of the old masters he admired and studied earlier. While his Impressionist peers remained faithful to their convictions focusing on effects of light, he advanced his technique achieving almost sculptural quality of his later paintings. The next generation of artist including Pierre Bonnard, Pablo Picasso, Henri Matisse, and Maurice Denis, all of them passionate collectors of Renoir’s work, were widely influenced by his distinctive combination of modernity and tradition.